Key insights from a marketing and product launch expert into building a high-performance team at a fast-growing organization. 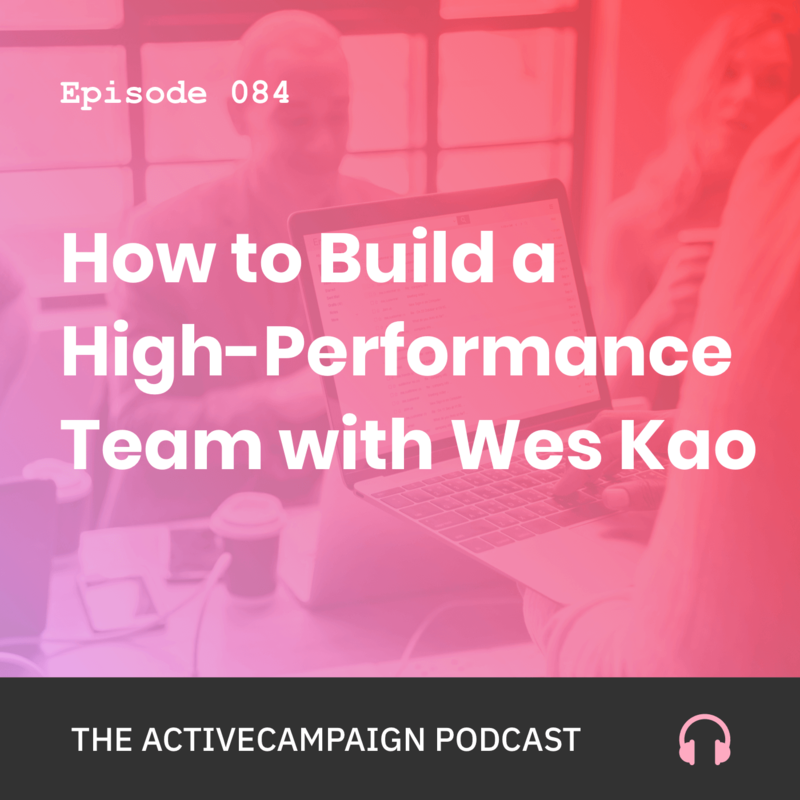 Wes Kao reflects on what she’s learned in her 10+ years of experience in marketing and building teams, to share key insights into building a high-performance team at a fast-growing organization. In addition, learn from Wes’ proven marketing strategies and her views on leadership in the workplace. Wes Kao (@wes_kao) is a marketing strategy expert who has led marketing teams at multiple B2C brands and has launched more than 150 campaigns, programs, initiatives, and products. Chris Davis: 00:24 Welcome to the ActiveCampaign podcast. I’m your host, Chris Davis. On this episode I have Wes Kao, a marketing consultant with over 10 years of in-house experience at Fortune 500 brands and venture-funded startups, one of which you may recognize as the atlMBA Seth Godin’s altMBA. Wes served as the executive director there, really helping build out not only that program, but the team to run it. It fits perfectly into the topic of the podcast today is we’re talking about leadership in high-growing or fast-growing environments, and how do you establish that high-performing team? The key, of course, is leadership, but Wes really details what does that mean? What does that look like? You’ll really enjoy the expertise that she puts on display when it comes to understanding the holistic view and approach to marketing. All of that is in this episode. Enjoy. Wes, welcome to the podcast. How are you doing? Wes Kao: 01:29 I’m doing pretty great, Chris. How are you? Chris Davis: 01:31 I’m excellent. I’m so glad to have you on because we get to talk about one of the topics I feel is so important, but just kind of gets glossed over when it comes to entrepreneurship, fast-growing startups in companies, and that’s leadership. Leadership and team building, so I’m ready to go, Wes, but before I push the accelerator, let me take a step back, and introduce yourself to the audience. Tell us a little bit about your background and your business. Wes Kao: 02:05 Yeah, that sounds great. Hey everyone, my name is Wes Kao, and I am a marketing strategy and product launch expert. I spent 10 years in-house working at brands like Gap, L’Oreal, Pier Essentials, an ad tech company called Flite that was acquired by Snapchat, and most recently I spent three years working side-by-side with best-selling author Seth Godin, building his online school called the altMBA. As of earlier this year, I’ve gone on out on my own to work directly with clients now, and I help teams prepare for a product launch so that they’re more likely to hit their sales and repping targets by creating messaging that appeals to people’s emotions and all the irrational, illogical reasons why people actually buy thing. I do that with workshops, training, one-on-one, coaching, consulting. The outcome there is really to have two things pop out at the end. One is a cohesive, unified message that all the different teams in the company can use, ranging from sales, marketing, BizDev, product, hiring. Then the other is having a team, a cross-functional team, that’s speaking the same language. When things are moving fast, and there’s a lot of parts, and everything should have been done yesterday, how do you make sure that everyone is running the same direction, and has a share language so you can speak in shorthand? You’re not having the same conversations over and over. By getting everyone on the same team, it helps the product launch go a lot better. Those are a lot of things that sneak up on entrepreneurs, that you just don’t think of when you’re starting, right? Like the product launch is so appealing and so exciting, you’re not thinking about those details that actually make the product launch successful. Before I go that way, I wanted to backtrack a little bit. Wes Kao: 05:04 Yeah, it was definitely more the intentional side. Wes Kao: 05:08 I didn’t know that marketing existed when I was little. When you’re in Kindergarten and the teacher asks, “What do you want to be when you grow up?” People say, “Firefighter, or doctor, teacher,” but my first foray into marketing came a very long time ago now when I was in high school. I started a non-profit organization called Packs of Love, where I donated backpacks and school supplies to underprivileged kids. During this process, having the idea was one thing. Making it a reality was completely different. There was a lot of stressful nights, and crying, and tears trying to make this a reality once I promised different family shelters and organizations that I would donate backpacks to them. Most of them would either hang up on me, or say, “How do I know that you’re not taking this for yourself? No I’m not going to donate.” I wrote hundreds of letters, and mailed them to places like Microsoft, and JanSport, and other places, asking for donations. I was just getting nos one after the other. I realized that I wasn’t thinking about how do I tell the story in a way that really empathizes with my audience, my audience being corporations and store managers that I wanted to donate money and invest in this cause. Once I stared thinking about that, things just changed completely. NBC News featured me, and Walmart donated, Target donated, JanSport sent boxes of backpacks. A bunch of stationary companies, Avery Dennison, sent boxes of pencils. These are all stationary brands that most people might not know. I ran that program for five years and learned a lot along the way. It was all through trial and error. The biggest lesson that came from that, and every year since then, even the past decade has really been reinforced, is the idea that the best idea doesn’t always win. The best product doesn’t always win. The best person doesn’t always win. If you’re chugging away, doing important work, but you’re not thinking about, “How am I going to get people excited so that they either want to contribute financially, or purchase my product, or be an ally, or help spread my cause,” you’re really doing yourself a disservice. Ever since then, I realized that marketing is that vehicle. Marketing is a vehicle to help people contextualize what it is that you’re doing, help people care more about important causes, whether it’s in the non-profit world, the for-profit world, whatever project it is that you care about, how do you transfer that enthusiasm that you feel, to another person, enough so that they’re willing to take action? Wes Kao: 10:03 It’s totally okay if they take a look at the product, or your idea, or your project, and they say, “This isn’t really for me.” I think as creators and leaders, it’s our role to think strategically so that we’re attracting the right kind of person, who’s there for the right reasons, and is going to be someone that you’re proud to be on this journey with. Chris Davis: 10:29 Yeah, absolutely, absolutely. Business, having fun or enjoying the process and journey is totally up to you, right? Wes Kao: 10:37 Yes. Totally. Chris Davis: 10:39 That’s the business part of it. It’s totally up to you. It’s very interesting that you say it though, because it makes sense saying that you identified that pain so long ago, now you’ve got all of this experience that essentially educated you on how to, what is your solution to that pain? It really helps you fine-tune it with every company and every business that you worked with. It’s one of the things that I always like to probe entrepreneurs, or any business, is how familiar are you with the pain, either from experience, or from other people’s experience? If you don’t know it, you’ve got some work to do before we can even talk about a product launch because how can you speak to it? How can your message really resonate with anybody going through the pain if you have no experience with it? Wes Kao: 11:27 Yeah. I’m really big on getting as close to the pain as possible for a couple of reasons. One is that pain is really the only thing that motivates people to do anything. It doesn’t have to be physical pain, obviously, but feeling frustrated with something, feeling like they’re fed up with something once and for all, and you’re ready to change. If there’s not that pain, there’s really no motivation to do something different. I think that this is one of the biggest obstacles that startups, and anyone doing anything new, faces. It’s the idea of the status quo, inertia, the way things have always been done. Chris Davis: 12:41 Why now? Wes Kao: 12:43 Someone could agree with you that, “Hey, I agree. This things is probably better, but don’t really want to go through the hassle of changing everything, and having to train everyone, and I already have so much on my plate.” Someone could totally agree with you, but whatever it is that you’re presenting actually would be good for them, but they just don’t agree on the timing.” That urgency, that piece of, “Why now?” Where is that pain? Why does someone need to take action? Being able to answer the, “Why now?,” question, I find, is one of the most important questions that you can answer as an entrepreneur or a creator. Chris Davis: 13:22 Yeah, and for those of you listening, Wes is taking us to school right now. This is Marketing 101. Seriously, if you can catch what she is saying at this moment, it’s going to make your marketing career just a lot more easier and effective. These are the things that aren’t like … You’re not going to be able to write a blog post on that, and it would be virally shared. You know what I’m saying? That was her first question. I was thinking, “Hey, Jen, let’s jump into the product. Let me show you what it can do.” She was like, “Wait a minute. What are they saying?” Essentially, she needed to know where are they at? What pain are they experiencing, so that she could answer that, “Why ActiveCampaign now,” for any potential user, as well as somebody using the platform. Anyways, it’s always refreshing to hear, just reiterate the responsible approach to marketing. Fast forwarding a little bit, or skipping forward a bit, now looking at your portfolio, of course you’re well decorated. You have worked with a variety of companies and figures. One thing that, when we spoke prior to this, that really caught my ear, was this idea of … I shouldn’t say idea, but the approach to establishing a high performing team. It’s what everybody, anybody who has adapted a team, mentality. Some people are still going at it themselves, but you’re going to get to a point where, and the team doesn’t have to be all hired. It could be some remote workers or whatnot. How do you get them to operate at their optimal? When they do that, you’re getting the best bang for your buck, but often times, people don’t know how to do that. What have you seen in your experience? How have you solved that problem, I should say, in the past? Wes Kao: 15:40 Mm-hmm (affirmative). There’s a couple things that could be helpful here. One is acknowledging that it’s your responsibility, as a manger and a leader, to help train your people and to help them level up. That might sound really basic, but it’s very easy to say, “Oh, well that’s HR’s job, that’s Learning and Development’s job. They did that one training course and workshop. I sponsored them to go to a conference. That’s me investing in their development.” That’s not true. The two things are very, very different to say, “Okay, this is R&D’s role versus I, as a leader, am responsible for this person’s growth.” If they’re not getting better at their job, and at life, by 20% every year, something is really wrong here, especially at fast-growing organizations, so much is changing. The company could look different every three months, that your people should really be leveling out to meet, or exceed, the demands of their role, and what the company is needing of them. One, I think, is if you’re a director, if you’re a VP, an SVP, anyone who manages people, you really need to be thinking about how am I building my leadership edge, and investing in making the people around me a lot smarter? That’s one. Second is understanding that uncertainty is the new normal, especially if you’re building something new, especially if you’re growing fast. There are going to be a lot of situations where you’re doing something that no one’s every done before. Even no one in your company’s done before, or no one’s done it in the exact same way as the way that you’re looking to do it. If you’re always looking for everything to be neat, and ready, and there to be complete certainty on something, then you’re never going to take that leap and move forward. If you develop this mentality, this culture, this understanding that things are going to be uncertain, there’s going to be a lot of ambiguity. We’re going to iterate, and we’re going to think through things, and be smart about them, but if something doesn’t turn out the way we expect, we’re going to be able to recover from it. That’s a whole different posture than saying that we need everything to be completely certain before we’re ready to move forward. Just developing that sheer understanding can really empower people to think for themselves, be willing to take responsibility, and know that hey, if something goes wrong, yes, I’m going to take responsibility, and know my boss isn’t going to go crazy, and be really angry or anything. Chris Davis: 18:20 Yeah, that’s huge. That’s really, as I’m thinking about it, it’s really like the foundation. It’s the groundwork. That has to be embedded into the culture, into the organization for existing, and everybody coming in. When you were talking about it’s the leaders, it’s their responsibility to grow the people under them by 20%, I love having an actual number too. You know what, Wes? It reminded me when I was in the corporate world, and working at Lockheed Martin, and I think the CEO, or somebody high up at the time, was sharing a story on how he would visit randomly different locations. He said he saw one young worker, fresh out of college, playing solitaire. He was playing solitaire on the computer while he should be working. Another thing that I’ve seen hinder high-performing teams is a lack of communication, where things are to be assumed when there’s already uncertainty. Just like you said, in these types of environments where things are growing fast, tomorrow could be different. You have the uncertainty, and then when you have the lack of communication in there too, now you’ve got speculation on top of uncertainty, and that has a very, at best, bad connotation for the [crosstalk 00:20:40]. Wes Kao: 20:40 It can be very dangerous. Chris Davis: 20:41 Very dangerous. Very dangerous. Yes. Chris Davis: 23:11 Yeah, and I love the responsibility word there. Everybody knows I’m big on responsibility. One thing that was really healthy for me, when I was working in the non-profit space, was I was working with an organization that was saying, “Everybody’s a leader.” Don’t just look to the ones you can visibly see lead. At whatever level you’re at, you’re all leaders because when you do that, everybody walks away with some accountability. I’m accountable to him, so I’m responsible for them, or him, or her. It creates ownership. Wes Kao: 23:54 Exactly. Yes. Leadership has nothing to do with your title. Chris Davis: 23:59 Yes. Yes, Wes. Wes Kao: 24:01 There are people with a leader title that are not leaders. There are people who are in the most junior ranks of an organization that are leaders. I think, especially going forward, when we think about the future of the workplace in the next 10 years, the people that are really going to stand out are the ones that can lead regardless of whether they have a title, regardless of whether they have a position or authority, and they’re going to be the ones that lead because they inspire people. They build trust with people. They build credibility through their actions because they’re reliable, because they follow through, because they’re trustworthy, and they get people to want to follow them. That really has nothing to do with officially what’s your title. It’s all about can you inspire people to want to follow you, and build that trust on the ground level. I say the trust part because when we think of inspiring people, maybe you think of Steve Jobs or someone really clinical inspirational, and you think, “Oh, I can never be inspirational. I can never inspire people,” but we inspire people every day. Normal people inspire the people around them to follow them when there’s a big project or a big idea, or some kind of change that you want to create. It’s super important to not get bogged down by, ” Oh, do I think that I have the right to lead others?” You absolutely have the right. Wes Kao: 25:52 We’re so like-minded. Chris Davis: 25:53 It’s so heavy because I know the repercussions of not doing it this way, not growing your leaders, and even like you said, Wes, it doesn’t matter on a title, if you have a strong leader in your organization, and you don’t identify that and grow them, you’re missing out on a huge opportunity instead of hiring somebody, which is always the shake of the dice, instead of being able to grow that person internal to your business. Every single startup that I’ve ever worked for, or worked with, has taken on the personality of the CEO, right? Wes Kao: 27:05 Yes, [crosstalk 00:27:06]. Chris Davis: 27:06 It grows to a point where it kind of evolves into its own thing, but that’s when it’s much bigger, but in those starter years, fast-paced things are changing, this and that. Every element of that CEO’s personality, every insecurity, every strength, every drive, everything, you see it throughout the organization, more so when it’s smaller than larger. If they understand the importance of developing themselves, and like healing their wounds, covering their blind spots, being aware. Wes Kao: 27:40 Whatever baggage that they have. Chris Davis: 27:41 Yes, right? It goes so much further, especially when we talk about teams and building teams that can perform highly. Essentially, that’s how you launch. That is how you launch products. This is the formula. Wes Kao: 27:55 Yeah, yeah, and I’m not surprised that organizations take on the personality of leader because on a day-to-day level, we’re constantly celebrating certain behaviors, and punishing certain behaviors in little ways, but people get the message. People see that, “Oh, when you do this kind of thing, the boss is really happy with you, and gives you kudos, and is really proud of you. When you do this kind of thing, it doesn’t fit with our culture.” I think the problem happens when leaders say that they value X, Y, or Z, but tolerate A, B, C, and those two things don’t align, so it’s confusing to people. It’s really confusing because you’re like, “Okay, you say that you value when I take initiative, and then I took initiative, but then you were upset at me because I didn’t run everything by you, or come to you first, or whatever.” There’s all kinds of misunderstandings and confusion that ends up happening, and so I think being super clear on, “Okay, what are the things that we actually celebrate, and how can you be intentional about celebrating those things in an effort to get more people and other people in the organization do them?” That’s really how you build the culture. Chris Davis: 29:21 Yeah. Yeah, Wes, I wanted to ask you a question about product launches. I know that’s a huge area of expertise for you, and one that you offer specifically, consulting for and whatnot. When it comes to launching a product, I’ve seen this done so many different ways. I’ve seen the person so willing to launch a product that they didn’t fully think it through. Then you have the opposite extreme of someone who has, you can clearly tell that they have overthought this process. I had an idea of a board game, and I was doing my research, and I was on this call, and I was telling the person about our game. I was like, “Yeah, me and my wife are going to make this game, and this, this, and that.” I was like, “When should I launch it? When should I let the world know because I want to be a millionaire.” You know, just pie in the sky stuff, right? He said this to me and it always stuck with me. He says, “If you’re comfortable with it, you probably waited too long to launch it.” I wasn’t ready for it then. I was like, “Oh man, this guy doesn’t know what he’s talking about. On to the next guy.” Hence, I never launched that board game, but for you, when it comes to launching the product, I have to assume you see more people that want to take longer than shorter. Chris Davis: 30:59 How do you help them through that process of letting them know, “Listen, you will improve on this later.” How do you get them to understand the importance, or knowing that what they have is ready for the market? Wes Kao: 31:14 Mm-hmm (affirmative), yeah. I think the most important thing is being aware of what the market wants. We so often fall in love with our product, whether it’s a board game, or this thing you want to do, and you’re super exited about it, and you assume that everyone else will be the moment that you launch it, and you imagine crowds roaring, and all the sales rolling in. A lot of times it’s crickets and tumbleweed. Wes Kao: 31:43 You didn’t do the upfront work, the actual hard part of figuring out, “Is there market demand for this thing that I want to build.” I think that’s the biggest mistake, or challenge, or obstacle, or common road block that I see all the time is people falling in love with the product without thinking about who would want to buy this product once it actually launces? Wes Kao: 32:13 The hard work, if you think about shifting your mentality about, “Okay, what is the hard part? Is the hard part actually building this thing, or is the hard part finding people who want to buy this thing?” I would say that it’s 100% the latter. It’s such a commodity now to be able to build any kind of product. There’s a lot of startups out there that if a competitor hired a extra dozen engineers in Poland, they could catch up with your software in 18 months or less. Product differentiation, featured differentiation, relying only on, “Okay, this is our software, this is our product,” really isn’t enough. You really have to think about how are we segmenting our user base? How are we offering the right thing to the right person at the right time? How are we speaking to them in a way that really hits on whatever pain points they’re feeling? If you’re not doing that, you’re going to end up spending a ton of effort, time, money, emotional labor in building this thing, your baby. You’re going to launch it, and then there’s not going to be a line out the door that wants it, and it’s very frustrating. At that point, it’s just very, very demoralizing. The more that you can build marketing right into the product launch itself, into the product itself, throughout the process thinking about how is every step of the process geared towards getting the customer excited about this thing, the better off that you’ll be. Wes Kao: 34:00 Exactly. That’s a great way to put it. Chris Davis: 34:02 It made me think, don’t cheat on your audience with your product. Com- Go ahead. Wes Kao: 34:13 Yeah, it’s easy to work on the thing that we love doing and are good at. There’s so many founders, entrepreneurs, leaders who are great at creating an amazing product, working putting the right technology in place, building the right structures, and that’s what they like doing. Whenever there’s any time, they’re like, “Okay, I’m going to work on that.” We want to convince ourselves that that’s the piece that’s really going to make a difference. By all means, definitely, a good product is very, very important, but if you’re not thinking at all about this other piece of how are we getting in the door? How are people hearing about this? How does this fit into their lives? This could be useful for us, but if it’s not useful for the person who’s going to buy it, they’re not going to buy it. Thinking about all those hard questions that you’re not sure how to answer, those are exactly the things that you need to be spending time trying to answer. Chris Davis: 35:12 Yes, I agree. I agree. The beautiful part about it is, I like to do it in just a regular Word document. I’ve got a way of just like brain dumping my audience, and the questions that I have, or I’ll collect the questions. How you answer those questions make all of your copy, and your marketing, and your email, all of your communications much easier. If you’re sitting down, and it’s a struggle writing copy for your product, that’s a tell-tale sign you need to go back and really clarify the benefits of this thing, the pains that the benefits map to the state of your audience, and what they’re demanding right now. Not later, but right now, what are the solutions they’re looking for, and what are the alternatives? Wes Kao: 36:00 Yeah. Yeah, and I would say that I’m not a huge fan of personas per se. I think it paints a really rigid picture of these are, let’s say, three types of customers that we have. I much prefer, and think it’s much more useful, to consider your audiences and you customers’ world view. What are the world views that they believe in? Chris Davis: 36:27 Oh wow. Chris Davis: 37:06 Right. Right. Wes Kao: 37:07 Those are two very, very different world views. One, you’re having to actually change their world view. You have to tell that person, who’s currently lounging on a couch, to say, “Okay, I need to spend an enormous amount of effort convincing you that you should exercise and eat healthy, and change everything about your life, like right now. Then, the hundredth step is, “Okay, now you should join our gym.” It’s a lot harder to sell to someone who has a different world view than yours. If you understand, “Okay, what is my customer’s world view, and how can I position my product so that it already fits?” It already fits nicely into their world view. That’s going to be a lot easier, and a lot more productive for everyone involved. Chris Davis: 37:58 Yep. Yeah, I agree. Wes, so many gems. Oh man, we could go on forever, but we are at a point where I want to respect people’s time. I want to respect their time, and I thank you for providing yours here. If people want to connect with you, and find out more about you, where can they go? Wes Kao: 38:24 You can go to my website, which is weskao.com. That’s W-E-S-K-A-O. com, or on Twitter. I’m @wes_kao. Chris Davis: 38:35 Got it, and all of those links, all of the information, again, will be below this episode activecampaign.com/podcast. Wes, thank you from the bottom of my leadership heart. My leadership and marketing heart to yours, thank you for coming on and blessing us with your insight in this space. Wes Kao: 38:57 Thank you so much, Chris. Chris Davis: 38:58 Yes, it’s been quite the pleasure. I’ll see you online, Wes. Wes Kao: 39:01 All right. Thanks. Chris Davis: 39:04 Thank you so much for listening to this episode of the ActiveCampaign podcast. Wes and I could have gone on for another hour or so. It always happens when I talk to Wes though, about leadership business, the importance of understanding both. Listen, I know we’re a technical platform, and I know we empower you to operate in a more lean capacity. I know we give you the flexibility to not have to work in your business as much as others. The same thing applies to your business that applies to any business that’s not leveraging our platform. It is that leadership is the key. Leadership is the key, and you’re going to need high-performing people on your team to ensure that they can not only carry out the vision and the mission of your business, but actually get those products launched. Get to the market in a way where you can meet the immediate demand, and the immediate needs, the immediate pain of your audience. Fall in love with your audience. Don’t cheat on your audience with your product. Get it out there. Get it into their hands. The urgency should be you knowing that another day has gone on with them not having a solution, and you knowing what that solution is. If you’re new to the podcast, we do this every week. This is my formal invitation to you to join the family of listeners, savvy small business owners, savvy organization growers, non-profit builders. Join in with your ears every week. ActiveCampaign podcast. We’re in iTunes, Stitcher Radio, Google Play, Sound Cloud, anywhere where you can subscribe to a podcast, we’re there. While you’re at it, please leave us a five-star rating and review. It helps get the word out. It vets us as a quality podcast that we are, vets us as the quality podcast that we are, so that more users, more people who are experiencing, or who could experience a better way of running their business because of this podcast, you all are instrumental in making that happen by leaving a five star rating and review. If you’re new to ActiveCampaign, or you’re just stuck, you’re trying to figure something out, you can’t quite do it, you don’t have the time to waste to figure it out, you should not waste that time. We have a Success team that’s ready and willing to provide aid at your call, at your beckon call. Activecampaign.com/training is where you can go and sign up for a one-on-one today, and talk to a human live about your business and ActiveCampaign. If you want to use the more self-guided approach, and learn as you go, as your schedule permits, at the times that are convenient for you, that’s what the Education Center is for. Activecampaign.com/learn will provide you all of the resources, all of the guided material and content that you can learn at your pace. This is the ActiveCampaign podcast, the small business podcast to help you scale, and propel your business with automation. I’ll see you on the next episode.